Targus THZ461EU Kickstand Case for Galaxy Tab 3 Lite 7"
Samsung TAB 2 7 Galaxy Tab 2 Screen Protector 7"
Port 201252 Detroit IV Tablet Case 7"
Speck SPKA2862 Folio Case for Galaxy TAB 4 7"
Speck SPKA2861 Folio Case for Galaxy TAB 4 7"
Speck SPKA2325 Pink Fitfolio Case for Samsung Galaxy Tab 3 7"
Speck SPKA2315 Fitfolio Case for Samsung Galaxy Tab 3 7"
Speck SPKA2119 Black Fitfolio Case for Samsung Galaxy Tab 3 8"
Speck SPKA2792 StyleFolio Case for Samsung Galaxy Tab 4 10.1"
Speck SPKA2771 StyleFolio Case for Tab 4 10.1"
The Port Designs 6-7" Mandalay tablet sleeve is a stylish and hard wearing sleeve for Tablets or EBooks that are between 6-7" in size. Compatible with the Kobo, Kindle Touch, Kindle Fire, Google Nexus, Samsung Galaxy amongst other tablets/Ebooks up to 7". 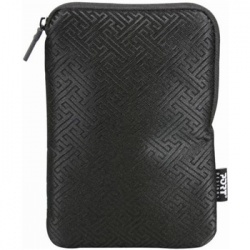 A stylish aztec exterior design and eye catching white Nylfex anti scratch interior ensure you'll look good whilst protecting your tablet/EBook, a rear back pocket offers a handy solution for storing cables/accessories. This light weight sleeve is ideal to carry on its own or will fit neatly into a traditional bag whilst ensuring protection against shocks and scratches to your tablet/EBook. A secure cover closure and soft interior lining to ensure screen protection when you are on the move. Access all ports, features and functions from inside the case. Provides a choice of viewing in landscape or portrait. With automatic wake/sleep functionality the durable cover transforms into a multi position stand for handsfree viewing and a comfortable typing position. 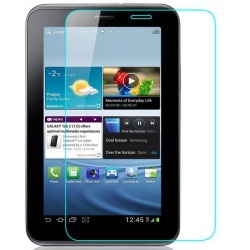 Simple, yet brilliant this tough glass screen protector offers, superb protection and takes just seconds to install. Anti-fingerprint, anti-smudge, anti-static, anti-scratch - just about resistant to everything! High touch sensitivity - so no loss of device screen use. Protects a wide variety of 7” / 8” tablets from the evils of everyday use. The four adjustable corners of the Proporta universal tablet case have morphed into a rubber holding mechanism that keeps the tablet safely in place, while always providing the best fit possible. 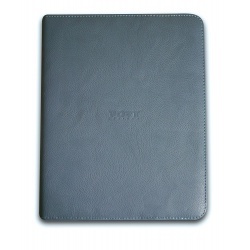 Made from high quality faux-leather, this universal tablet case has a textured finish for easy grip and multiple-viewing angles for desktop video viewing. 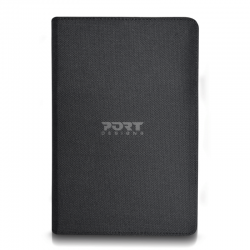 A portfolio designed to provide an optimal protection for your tablet 7''. The innovative Universal Elastic System (U.E.S.) ensures a maximum compatibility with a wide range of tablet. A smart elastic band will keep the portfolio closed at all time and secure your tablet while on the go. 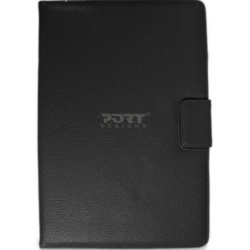 An universal portofolio designed to provide an optimal protection to your 9/10'' tablet. The innovative Universal Elastic System (U.E.S.) ensures an optimal compatibility with a wide range of tablets. The elastic strap will keep it closed while on the go and the adjustable viewing angles will offer you the best video and typing experience. The Speck FitFolio (Raspberry Pink) are Samsung Galaxy Tab 3 cases that combine the fit of a precision-molded hard shell case, with the cover-to-cover protection in a book-style folio. The form-fitting hard-shell cradle keeps your Samsung Galaxy Tab 3 securely in place, so it doesn't slip or slide, even when the cover is folded back and held in one hand. A vegan leatherette book-style cover protects your screen wherever you take it. The cover of this Samsung Galaxy tablet case is lined with super-soft padded microsuede and held securely in place with a secure clasp. Fitfolio case fits Galaxy Tab 3 7.0"
Designed to fit the Galaxy Tab 3 7.0" as snug as possible while giving you access to all of the ports, camera and speakers. Specially designed to complement your minimalist Galaxy Tab 3 7.0, the slim, lightweight cover looks good–and feels good, too. The form–fitting cradle secures your tablet, when you're in cyberspace–shopping on Amazon or reading your Flipboard–and when you have to move around in the real world. Reading? Writing? Re–watching that funny YouTube video? With four viewing angles, there's one that's right for everything you do. When you're on the go, closing the FitFolio Galaxy Tab 3 7.0 case is a snap. 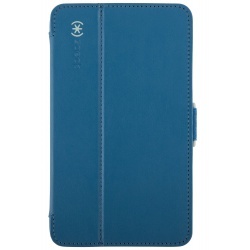 Compatibility: Samsung Galaxy Tab 3 7"
Guard your Samsung Galaxy Tab 3 7.0 against scrapes and scratches with this Speck FitFolio SPK-A2315 case, which features a vegan leatherette cover with a padded micro suede lining. The custom-fit cradle securely holds your device in place. 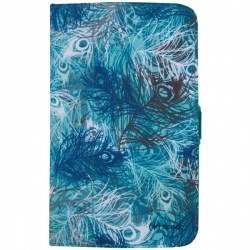 The Speck FitFolio (Peacock Plumes Blue) are Samsung Galaxy Tab 3 cases that combine the fit of a precision-molded hard shell case, with the cover-to-cover protection in a book-style folio. The form-fitting hard-shell cradle keeps your Samsung Galaxy Tab 3 securely in place, so it doesn't slip or slide, even when the cover is folded back and held in one hand. A vegan leatherette book-style cover protects your screen wherever you take it. The cover of this Samsung Galaxy tablet case is lined with super-soft padded microsuede and held securely in place with a secure clasp. 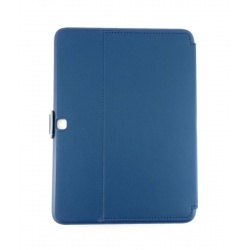 Specially designed to complement your minimalist Galaxy Tab 3, the slim, lightweight cover looks good and feels good, too. 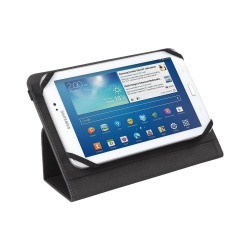 The form-fitting cradle in these Samsung Galaxy Tab 3 cases secures your tablet, when you're in cyberspace shopping on Amazon or reading your Flipboard and when you have to move around in the real world. Reading? Writing? Re-watching that funny YouTube video? With four viewing angles, there's one that's right for everything you do. When you're on the go, closing the FitFolio Galaxy Tab 3 case is a snap. 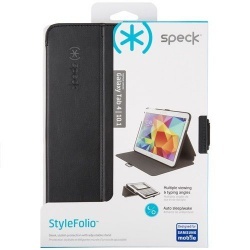 Compatibility:Samsung Galaxy Tab 3 8"
The Speck FitFolio (Black) are Samsung Galaxy Tab 3 cases that combine the fit of a precision-molded hard shell case, with the cover-to-cover protection in a book-style folio. The form-fitting hard-shell cradle keeps your Samsung Galaxy Tab 3 securely in place, so it doesn't slip or slide, even when the cover is folded back and held in one hand. A vegan leatherette book-style cover protects your screen wherever you take it. The cover of this Samsung Galaxy tablet case is lined with super-soft padded microsuede and held securely in place with a secure clasp. 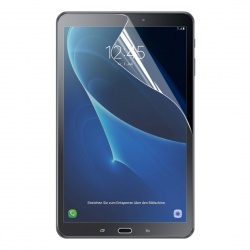 All-around protection with stunning design, this Speck StyleFolio Deep Sea Blue/Nickel Gray Case for Samsung Galaxy Tab 4 10.1" stands sleek and stylishly in multiple viewing angles and a typing mode. A vegan leather cover is complimented by vivid colours and high-res patterns while a secure closure clasp safely locks your Galaxy Tab 4 when you're on-the-go. StyleFolio's all-around protective hard shell keeps your Galaxy Tab snug and scratch-free with a soft inner lining to save your Samsung tablet from accidental bumps, drops and spills. Vivid colours and high-resolution patterns garnish StyleFolio's easy-to-clean vegan leather cover, making your Galaxy Tab 4 look better than ever with a seamless, impeccable design. A locking clasp secures your Galaxy Tab 4 in chic contrast colour accents in either a folded mode or shut for when you're on-the-go. Reading? Typing? Re-watching that funny YouTube video? With so many ways to view and type, you'll be sure to find the perfect angle for you. Integrated, sealed speaker scoops acoustically project sound towards the user to improve sound quality and amplitude. 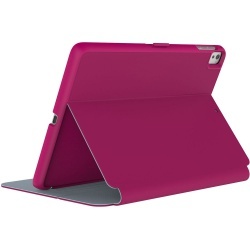 Compatibility: Samsung Galaxy Tab 4 10.1"
Protect and safely store your 9.7" iPad Pro, iPad Air, or iPad Air 2 in the fuchsia pink Speck StyleFolio Case. This all-around protective hard shell features a bold fuchsia pink and nickle gray color-blocked exterior. A soft inner lining protects the screen when the case is secured shut by way of a locking clasp. When opened, the front flap can be folded to accommodate multiple viewing angles for movie watching during a layover or presentations to future clients. For added convenience, the vegan leather exterior is easy to clean in the extreme case of dealing with an unwanted smudge or mark on your case. 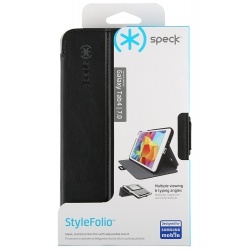 Speck StyleFolio Case for Tab-4 10.1"